The purpose built holiday resort of Costa Ballena is conveniently located about an hour away from Seville, between Rota and Chipiona in the centre of the Costa de la Luz. Surrounded by fresh water lakes and pine-covered hills, the holiday resort was designed with the environment in mind and one will not find the typical high-rise hotel blocks common to many beach resorts here. In fact, visitors to this Spanish resort will find the town's parks and gardens a breath of fresh air when compared to your typical holiday resort towns. Costa Ballena has been hailed as a one of a kind holiday destination in Europe, environmentally friendly while still offering a range of exciting holiday activities and amenities. A rather romantic story is attached to the town's name: In ancient times, a large whale (ballena in Spanish) who had travelled all over the world was seeking a sanctuary, a paradise in which to end its days, and after much wandering it chose a spot near the coast of Cadiz, Costa Ballena, to die happily surrounded by beauty and harmony. The town itself comes pretty close to paradise and while on holiday visitors can enjoy beautiful surroundings dotted with lakes, orchards and parks, uninterrupted stretches of beach, and numerous fun activities and cultural excursions. Costa Ballena is not known for its shopping opportunities, but there are some boutiques and souvenir shops in the hotels and along the beachfront, and the little villages surrounding the resort - seemingly quite untouched by tourism - host craft and fresh produce markets. The hotel restaurants, where visitors tend to eat, offer the usual international fare and are nothing to write home about. However, there are some more upmarket options and excursions into the surrounding countryside will unearth glorious vineyards and village eateries offering traditional Andalusion food and wine. Costa Ballena is primarily a family resort and although there are some beach bars and discos the majority of nighttime entertainment is organised by the hotels and is likely to disappoint young party animals in search of a clubbing scene. 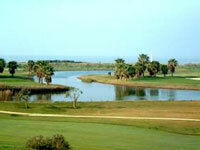 The many outdoor activities at Costa Ballena include horse riding, bowling, golfing, surfing and windsurfing. The miles of lovely beaches provide plenty of space for walking, swimming and tanning. Visitors on holiday in Costa Ballena can also explore neighbouring areas and soak up some traditional Spanish culture, visit sherry-producing bodegas and whitewashed villages, take a boat to Doñana Natural Park, or catch a spectacular Andalusian horse show. The Cadiz province of southern Spain is known for its ancient vineyards and good wines. Although generally wonderful for families, Costa Ballena's lack of a pumping nightlife may discourage young singles.